Santiago de Compostela, a UNESCO "World Heritage City", is one of the most historically and culturally significant cities in Europe. For over a millennium, pilgrims have followed the Camino de Santiago to this city of medieval origins in northwestern Spain, where, according to legend, the body of Saint James was miraculously discovered during the ninth century. Located in the autonomous community of Galicia in northwestern Spain, Santiago offers a fairly cool, moist climate with beautiful green countryside. The Atlantic coast is nearby, with a spectacular landscape of dramatic cliffs, rocky inlets, and sandy beaches. Santiago is a dynamic, cosmopolitan city with a fascinating mixture of new and old. While it continues to be a popular site for European tourists and spiritual pilgrims alike, it is also a major college town. Santiago, in addition, functions as the political and cultural capital of Galicia and thus offers broad range of activities, concerts, sporting events, museums and theatres. The great majority of Santiago's population is composed of students, and, as such, it is a city that constantly caters to their needs and interests. Santiago is one of the most famous places of pilgrimage worldwide, so of course many of its traditional festivities are of religious character. Semana Santa, Easter week, is celebrated as in most major Spanish towns with impressive processions. In May takes place the interesting Feria del Ganado, which lasts for 10 days. Apart from performances by folklorist groups it is also a culinary festival, and you have a great opportunity to try all the specialties of the regional kitchen. The name Santiago goes back to the Apostle James (Saint James = Santiago) who went to this most north-western part of Spain, called by the Romans "Finis Terrae", "end of the world", to preach and convert people to Christianity. After returning to Palestine in 44 AD., he was taken prisoner by Herod Agrippa and tortured to death. The king decreed that it was forbidden to bury him, but in the night Jacob's disciples stole the body and brought him, in a sarcophagus of marble, on board of a small boat. 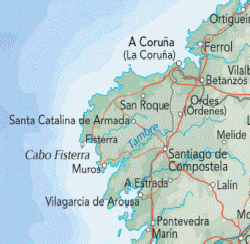 The current of the sea drove the boat to the Spanish coast, into the port of the Roman province's capital, Iria Flavia. Here the Apostle was buried at a secret place in a wood. Centuries later, in 813, the hermit Pelayo heard music in that wood and saw a brightly shining star. This place was called, in Latin, "Campus Stellae", field of the star, the name that was later turned into Compostela. Bishop Teodomiro, who received notice of that event, instigated an investigation, and so the tomb of the Apostle was discovered. King Alphonse II declared Saint James the patron of his empire and had a chapel built at that place. It is reported that from then on Saint James did several miracles, it was even said that he fought side by side with King Ramiro I in the decisive battle against the Moors. More and more pilgrims followed the way of Santiago, "Camino de Santiago", and the original chapel soon became the cathedral of the new settlement, Santiago de Compostela. In 12th and 13th century the town had its greatest importance, and Pope Alexander III declared it a Holy Town, like Rome and Jerusalem. Pope Calixto II declared that the pilgrims who went to Santiago in a Holy Year should be free of all their sins. El Año Santo (Holy Year) is celebrated each time when the Apostle's day (July, 24) is a Sunday.